Dust Jacket Condition: Includes dust jacket. LeAnn Thieman is a nationally acclaimed professional speaker, author, and nurse who was accidentally caught up in the Vietnam Orphan Airlift in 1975. 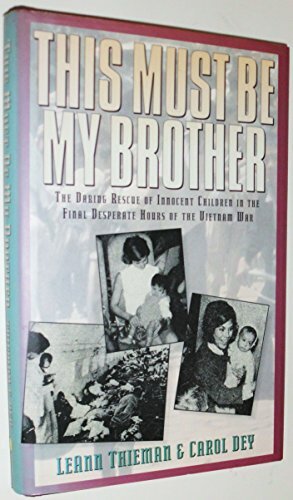 Her book, This Must Be My Brother, details her daring adventure of helping to rescue 300 babies as Saigon was falling to the Communists. An ordinary person, she struggled through extraordinary circumstances and found the courage to succeed. LeAnn has been featured in Newsweek Magazine's Voices of the Century issue, on FOX-TV, BBC, NPR, PBS, and countless radio and TV programs. After her Operation Babylift story was featured in Chicken Soup for the Mother's Soul, LeAnn became one of Chicken Soup's most prolific writers. Her devotion to thirty years of nursing, made her the ideal co-author of Chicken Soup for the Nurse's Soul. She went on to coauthor 11 more Chicken Soup books, including Chicken Soup for the Christian Woman's Soul, Chicken Soup for the Caregiver's Soul, Chicken Soup for the Father and Daughter Soul,Chicken Soup for the Grandma's Soul, Chicken Soup for the Mother and Son Soul, Chicken Soup for the Christian Soul 2, Chicken Soup for the Adopted Soul, Chicken Soup for the Soul, Living Catholic Faith,Chicken Soup for the Nurse s Soul, Second Dose,Chicken Soup for the Soul, A Book of Miracles,Chicken Soup for the Soul, Answered Prayers. As a renowned motivational speaker, LeAnn shares life-changing lessons learned from her Airlift experience. Believing we all have individual "war zones," she inspires people to balance their lives, truly live their priorities and honors them for the difference they make in the world. LeAnn is one of about ten-percent of speakers worldwide to have earned the Certified Speaking Professional designation and in August, 2008 she was inducted into the Speaker Hall of Fame. LeAnn and Mark, her husband of forty-five years, reside in Colorado where they enjoy their empty nest. We accept payments through Abebooks.